Repeating last year’s success, Osmotex attended ISPO in Munich again in early 2018. ISPO is the world’s largest international multi-segment fair for the sports industry, with close to 3000 exhibitors each year. ISPO addresses each level of the sports value chain spanning 16 halls including segments like snowsports, outdoor, health & fitness, urban, teamsports, vision, trends, innovation and industry services, and manufacturing & suppliers. The Osmotex news-release showcased a jacket that is the sign of what’s to come to consumers this year: clothing with embedded electronic moisture management that allows you to sweat without feeling wet. After a period of rigid testing with remarkable results, Osmotex promises HYDRO_BOT to be commercially available in sportswear in the course of 2018. In 2017, Osmotex conducted the technology launch and following the success of last year, 2018 was a visit with more commercial dialogue and interest. The HYDRO_BOT team is now in serious dialogue with a large group of potential partners to bring the technology to market. 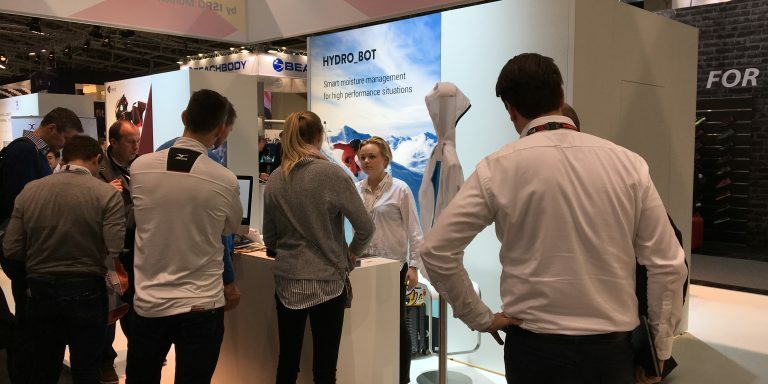 The HYDRO_BOT stand was occupied by one part of the team to host visitors walking by, while the other part of the team held scheduled meetings with many of the world’s most famous sports brands. Osmotex now offers “developers kits” – a kit to be integrated into a jacket in order for potential partners to be able to try the technology. At ISPO, these kits were handed out to a small number of potential partners – due to limited resources.